There are lots of trees in trouble from the heat and drought this summer, but some of the problems are exaggerated by poor landscape design, installation and management. These are bald cypress that have burned up along Central expressway (75) in Dallas. Plastic fabrics were used at planting, for weed control I suppose. Of course the fabrics failed and herbicides were sprayed. Both techniques hurt the trees. Drip irrigation was used and you can see why I don't recommend it for landscaping work. The solution to this mess is to remove all the plastic, fabric, fix the irrigation system and mulch the trees with shredded native tree trimmings and fertilize with organic fertilizers, all of which will reduce the stress on the trees and minimize the damage that could be done in the future. 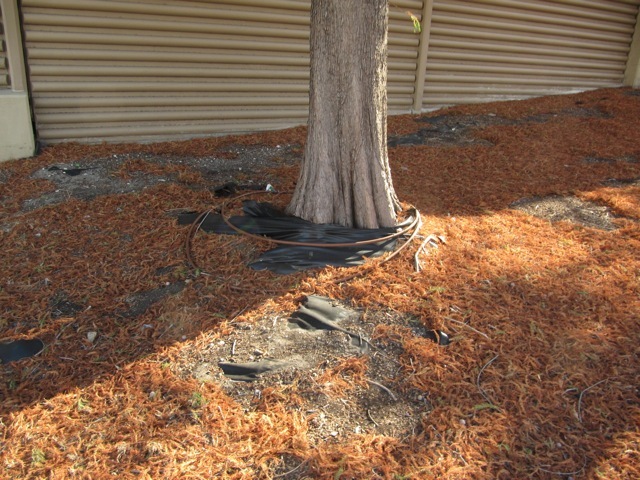 Another tip related to bald cypress use is to switch to other similar plants. 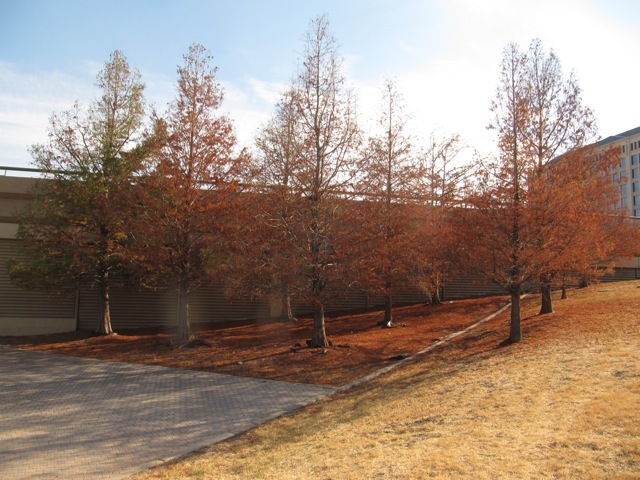 Even properly planted bald cypress trees will often have brown interior foliage in late summer. Part of this issue is mites attacking weaken trees and chlorosis due to poor seed sourcing. Many nurseries sell bald cypress that are more adapted to sandy acid soils that alkaline calcareous soils. The trees that are much better choices and rarely have the problems discussed here are Montezuma cypress and dawn redwood. Details about the trees and where they will grow are on the web site. Simply used the highlighted links. To discuss this newsletter or any other topic tune in 8am -11am CT to the Dirt Doctor Radio Show. The call-in phone number is 1-866-444-3478. Listen on the internet or click here to find a station in your area.